SOUR TANG HAS MOVED TO: THEKELLYTANG.COM: Fashion for a Cause! Just watched the documentary of 'Invisible Children', I know I am like six years late for the documentary and everything. But, finally, I got a chance to watch it. It was a moving film and it's inspired me to do a post on fashion for a cause. For those, who do not already know, invisible children was first a documentary that showed the tragedy in Northern Uganda, where children are abducted in the night to be brainwashed into being child soldiers. Its a disgusting practice, where children learn only to murder and kill. They must flee the comfort of their homes in order to protect themselves. If you have a chance, watch it here! Ok, now onto the fashion part of it all. Invisible Children has a bracelet campaign, where money is donated to purchase a bracelet made in Uganda. And the profits from the bracelet is able to provide jobs to those in need, and for children to go to school. These bracelets are made of reed and recycled wire. Each different color represents something different, they even have videos on their website that shows us what each bracelet is about. These bracelets are simple and chic so they can match with any outfit. They also follow well with the current "hippie" trends that I have been seeing. Toms Shoes: Buy a pair of shoes, donate a pair to a child in need. I know.. 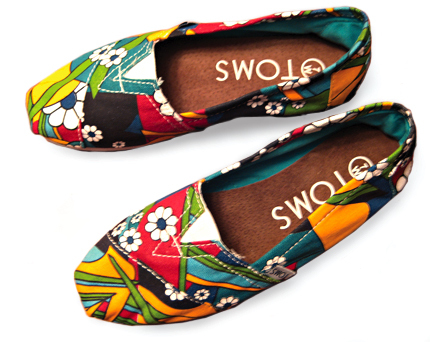 I've totally ranted and raved about Toms shoes. FEED Bags: Through the sales of these bags, FEED seeks to raise awareness of child hunger, and provide an eco-friendly bag that is stylish and compassionate. FEED. INVISIBLE CHILDREN. TOMS SHOES.